Use the term “prepper” and most people’s minds will think about the “Doomsday Preppers” show on the National Geographic channel. They glance at you with a wary eye or an outright laugh and call you an extremist, or they may suddenly have an appointment they need to get to. There are extremists in every group no matter what the subject and the truth in just about all of the possibilities is that most people fall in the middle somewhere. Thanks to Hollywood, most of America believes the behavior of those portrayed on television is the norm and that all preppers are like that. The truth is, even true preppers think that some of these people are extreme. When I talk to people, I usually say I am a homesteader because it is more readily acceptable to society. I can forgo the funny looks or snickers when I walk in a room. Ironically enough, it is usually me who is chuckling at the ‘sheeple’ who have had the skill of independent thinking and providing for themselves leached out of them. They do not realize that a ‘homesteader’ who gardens and preserves the food for the winter is not much different than a prepper. The average prepper stocks up on supplies the same as a homesteader does. In truth, there is not much difference; both seek to be self-sufficient and survive unforeseen events that may come their way. When I used to tell people that I was a prepper, the questions just blew me away, and this was before Doomsday Preppers came out. 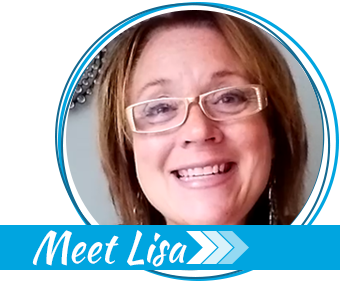 The following list is some of the most common questions and myths that I have heard or have been asked. Some are downright insulting and others laughable. Overall though, I can say with confidence that for the majority of the people out there who consider themselves preppers, none of these are solid truths. As I said above, there are extremists in every group or social gathering all over the world. These people define the far reaches of what is acceptable and the majority of us hang out somewhere in the middle. Speaking for myself, the only thing I am extreme about is trying to learn how my grandparents did things and how they got by. They were more self-reliant and that is my “extreme” goal. I do not want to have to rely on the grocery store as much, or worry if my city drinking water is actually safe to drink. Being prepared is about having enough ‘stuff’. This could not be further from the truth. Sure, your chances of making it through whatever disaster will be increased if you have the right items to stay warm and hydrated, but even if you have the most expensive canvas tent money can buy, it does you no good if you cannot carry it, set it up, or know how to make sure it doesn’t get blown away. The item itself is great, but if you do not have the skills to use the item, it is just so much junk. Worthless. What good is having a lantern to light your way if you have no skill in how to light it? Skills trump, period. The answer is a resounding NO! I do not hate my government nor am I against having one. In many ways I am grateful that the government I live under is designed so that I can be free to make my own choices and live the way I want to. “I bet you really hate politicians and cops then, right?” I was actually asked this once and all I could do was stand there with a shocked look on my face, mouth slightly open, trying to determine if I had heard him right. It took everything I had not to ask him if he was a special kind of stupid before explaining that in general, most prepper types have no issues with authority figures until such a time as their rights are infringed on. That is not an extremist point of view, that is basic human nature. Images of warehouses filled to the ceiling with freeze dried and packaged food, shipping containers of toilet paper and first aid supplies, and don’t forget the ammo. The bottom line is that most people cannot afford to buy a year’s worth of toilet paper in one go, or fill the cupboards with enough food to last 6 months for a family of 4. We get by the same as most anyone else, usually paycheck to paycheck. This one cracks me up. There was an episode of Doomsday Preppers where the guy had a grenade launcher. I laughed so hard that I had to pause the show. Who has a grenade launcher as a normal thing in your arsenal? Why do people believe (some strongly) that preppers have dozens of guns and thousands of rounds stashed away to kill everyone off who tries to get too close. The reality takes us back to #5: who can really afford all of that? Most people cannot, especially in this economy. They are prepared for anything. Again, this one cracks me up. A lady once said that I am not a real ‘prepper’ unless I am prepared for any situation, even the ones that are highly unlikely to happen in my locale. 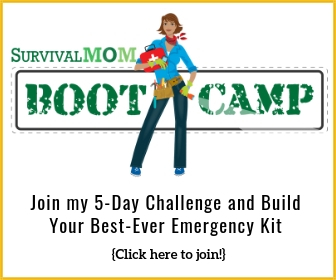 Why would I be prepared for a tornado in Southeast Alaska? We barely get thunder and lightening storms here, let alone the right conditions for a full blown tornado. No, most preppers have already considered the higher threats from Mother Nature in their area and taken steps to provide for, during, and after the event. Truth be told, at the end of the day we all need the same things regardless if it was an EMP or an earthquake that caused the disaster. Preppers have plenty to spare. This touches on points made in # 5 and #7. We are NOT prepared for absolutely everything and no one really can be. I don’t know anyone who is working toward being self-sufficient or prepared for emergencies that have anything to spare whatsoever. That does not mean we wouldn’t help some people out but to think and believe that preppers will just hand out supplies to whoever without expecting anything in return is unrealistic. They all have a bunker or cabin to bug out to. Someone asked me if I chose a cabin or a bunker for my bug out location. When I replied neither, I was laughed at and told that I wasn’t a real prepper. Truthfully, I silently snickered at the person thinking about their level of ignorance, but it got me to thinking. In almost all of the episodes of “Doomsday Preppers”, people had someplace to hunker down and hide. The truth is, most preppers can barely afford their rent or mortgage, let alone a second one for a bug out location. We rent and would largely be stuck in place but should we need to get out of town, there are people in our group who have property we could head to but we own no bug out location of our own. Preppers WANT something to happen. This is the clincher for me. This one gets my blood hot. I imagine in this wide and varied world of ours that there are preppers out there who actually watch the news with bated breath, actually hoping that some catastrophe will happen so they can climb into their bunkers with 5,000 rounds of ammo and MRE’s to feed on for 5 years, but I have yet to meet one. If I did meet one, I would ask them if they had taken their meds that day. To actually wish or want something that could kill off the larger population or even kill the planet overall is ludicrous! I do NOT want something horrible to happen that would cause me to need my skills and the bits of provisions I squirreled away. I would much prefer to have them and never need to use them. 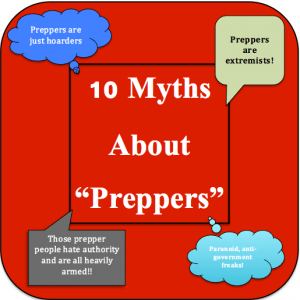 As you can see, there are some crazy ideas and myths out there about what a prepper is, does, and thinks. Your grandparents called it normal living. Your children call it prepping. I call it smart, forward thinking. Whatever you call it, be realistic and moderate when you consider preparing for getting through emergencies! I suppose I am a mild prepper, and I too have had folks ask ” are you wanting something to happen?” Why hell no , I happen to like thick steaks, cold beer, AC and all other amenities that I enjoy now ! I am ready if (assuming anyone ever is) to maybe have it easier than someone that hasn’t done anything. Also my fire extinguisher is charged ( not expecting a fire though) and other things are ready if need be. My husband is gone a lot with work. I want to be prepared to handle anything that may come. I don’t want anything to happen but if it does I’ll be prepared. I carry medical insurance and have recently added Aflac policies for major medical issues such as cancer for a couple of dollars a week. Does that mean I *want* to collapse and be in the ICU for a week or *want* to get diagnosed with cancer? Heck, no! It means that IF those horrible things should someday happen, I will be able to survive and move forward the best I know how. For me, it’s the same with preparedness. I don’t really like the word “prepper”, so I use the term we use in the workplace “preparedness” instead. I learn, buy, and do certain activities so that IF something horrible should someday happen, I will be able to survive and move forward the best I know how. Great comments all! It is nice to know there are others out there who see the need for preparing for future events. I find that most people who live in the midwest are more open to having some supplies on hand to get them through the horrific weather they have to deal with. Those in large cities tend to scoff at those of us who see the need to mitigate risk and make sure we are going to be OK.
preparedness and they never turn a hair. home to tell me has been laid off, or one of us is ill or injured. and food preservation, both canning and dehydration. If they ask if you hate the government, tell them “No, on the contrary, I am following my government’s recommendations” and refer them to the FEMA website so they can support the government also. I have a picture someone sent me of a FEMA billboard – the really big kind. Pretty stunning to see the “prepare” concept near downtown Seattle. Thank you so much for writing that, it is really accurate. I have to say sometimes I do wish something would happen if only to shut those up who laugh at us, but in actual fact, I am dreading what I believe is coming, more for the unprepared than myself, though we will all be affected to an enormous degree. I have somewhat of a hard time dealing with people who sneer or condemn those who prepare because I consider them to be short-sighted. Why bother getting life insurance, house insurance or car insurance? Are you anticipating something happening? Oh! You’re just being careful! So what’s wrong with food insurance? I’ll stop there as I’m already getting heated. I think part of the reason why number 1 and 10 exist is because it does in many ways require you to be putting a higher value on disasters because its not just a matter of being prepared or not. The health insurance provides a great analogy to work off of as it slightly more transparent. You need to consider the cost of prepping, chances of disaster, and the benefits from it are worth it. With insurance this is much easier to quantify as the cost is stated up front, you can find statistics on the chances of various diseases as well as asses your own health and hopefully what types of benefits you get from the insurance should you need to use it are adequately explained. From there you would decide whether to get the insurance or not. If its a couple dollars a week you might, if it was a lot more you probably wouldn’t. Even though you might want to be prepared there will be a limit as to what you are willing to do and what you should do to achieve that and that’s where the disagreement comes from. Buying books, MREs, teaching yourself survival skills, or doing something like maintaining a garden all have costs whether it be time, money or likely a combination of both. While a prepper may not see the costs as high to many others it will be and it depends a lot on each persons situation. This would also be why people in cities are more to scoff at it then people in the midwest where you have more space. If you already have a yard or house a lot of the things you might do to prep become much cheaper. If you live in a city where the cost to prepping is much higher it is a less sensible thing to do, some people will still find it worth it but its not going to be as common and that makes sense. The same goes for people with less income, a lot of people already have many expenses to their time and money and so get more from spending what they have left on other activities. Well, I live in NYC and I prep. Maybe I’m not building up a year’s worth of supplies, but I have a good bug-out/extreme camping bag loaded and shelf-stable food and water. After 9/11 we were on lock-down. No one and nothing in or out of the City. Bridges, highways, ferries, and streets closed down. I’ve kept extra stuff around every since. I think of myself not so much as a prepper but as a person striving for self-sufficiency. I have some suppies but I’m more concerned with learning how to do without. I’ve learned how to preserve food like my grandmother, grow my own food (We’ve had huge gardens since I was a kid), and use and repair all kinds of tools. I’m currently learning about alternate energy production and storage. Our grandparents knew all kinds of things to “get by”. I want to be able to do that too. Do I hate my government? Well, I havent met too many people that DONT hate politicians in this day and age; the Congressional approval rating being in single digits for more than a decade kinda backs me up there as being “normal”, anyway. Besides, Ive worked for my government. Thats the biggest reason I have for not trusting them. Maybe prepping is like Islam, communism, materialism etc. – it’s the extremists and the crackpots who get all the attention and give something a bad name. You have to admit that those folks on Doomsday Preppers are out of their minds, they really aren’t normal, but you’ll probably find that they represent only the very smallest fraction of the prepping fraternity. Yet, because they’re on TV ‘outsiders’ like me can only have them as our reference point for what it’s like to be a prepper. In another instance a prepper agreed to eat a worm if the producer promised to eat one, too. Once they got the worm eating on video, the producer said, “No way am I going to do that.” So, you see a nutty prepper eating a worm, which he had previously said he wouldn’t do. He was too trusting. There are numerous other examples of this type of questionable integrity on the part of Doomsday Preppers. Needless to say, I had no further interest in being involved with the show or with anyone attached to the show. It would seem to me that you are the unusual one, when it comes to prepping. Most that I know are described in your article. 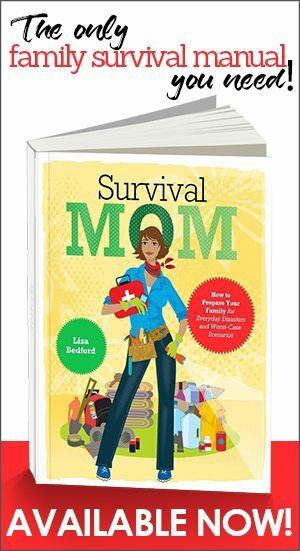 There are even groups of preppers that buy things together and have a common bug out location, also described in your article. I would compare the dozen or so that I know to those seen on Doomsday Preppers, which probably started them on their mission to be like those seen. I was pretty sure the whole world had lost its mind until I came across this article. It’s interesting to see someone compare prepping with homesteading, as I’ve never heard of such until now. I like the current term of homesteader instead of prepper! Some of the things in your posting are correct for some main stream preppers/homesteaders and some aren’t. There are a lot of gun guys & gals who own A LOT of guns and ammo and they are preppers also. I think that’s probably a lot more common than what some folks would think. I think that there are some folks who store a lot of food with no real idea of what they would do if tshtf and no idea of how they would procure/produce/process food to refill their stores if need be. 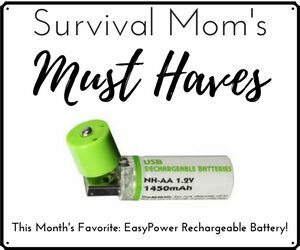 I subscribe to a couple of prepper/homesteader groups on social media and there is an awful lot of gadget getters on them. They like to show off talk about their newest purchases of whatever someone told them was essential for their bug out bags, etc. I suspect that most of them have never spent a night in the woods with just a sleeping bag, and some minimal supplies, never took an animal from a live creature to presenting it on the table as dinner, never grew a tomato, maybe never even used an outhouse that had no tp, (or a log in the woods). Most of them would be lost without their smart phones to google how to do some of the simplest tasks! Even if you live in a high rise apartment in the heart of the city, do you have enough food to prepare three meals a day for you and your family for a week? Do you have any info in books or on paper if the grid and/or the internet goes down and you can’t access your files? So I think a lot of folks WANT to be preppers but are not really willing to put out the effort. My wife is 59 and I’m 60 and we have a little farm, where we grow our own beef, eggs, and a large part of the vegetables we consume in a year. Cindy can can fruits and veggies. We have a team of horses we don’t use much, but they are broke and we have enough equipment to use them for our only power source if need be to grow enough food for ourselves and them! And we both work full time. Most of our “town” friends think we’re nuts! At least they think I’m nuts and they kind of feel sorry for Cindy for having to live like this! LOL which is how our parents and grandparents survived and thrived! Maybe not thrive by Wall street standards, but we had plenty to eat and a lot of love in our homes. Our kids kind of get it, but they are pretty well ensconced in modern living and think we should “get real”. I thought we were?! Any how I’m pretty sure a lot of people who want to be preppers are long on stuff and short on skills. And a lot of people who really are preppers most folks have no idea that they are so well versed in life skills! Sounds like you have more faith in the integrity of the minions of the fedgov, and law enforcement than some of us. 😉 To “hate” them is wasted energy. To trust them could be much worse. On the other hand, you have confirmed one facet of “prepping” than I had previously thought was a myth……….You live in SOUTHEAST ALASKA???!!! I have zero faith in the federal govt, their minions, their agencies, etc. 🙂 Just to set the record straight. I call myself an anarcho-capitalist. Leave me alone and let me make money. 🙂 At any rate, this article was written by a blogger who lives in Alaska — I’m in Texas. This is much more how I perceive you. And Texas sounds more practical and smart, in every way.